Manhunt: Unabomber is an American 60 minute scripted crime television series, which kicked off on August 1, 2017, on Discovery Channel and is broadcast every Tuesday at 22:00. The show is currently in its 1st season. Discovery Channel opted not to pick up Manhunt: Unabomber for Season 2. Manhunt: Unabomber officially canceled on Discovery Channel. Sign up to track down your favorite TV shows. 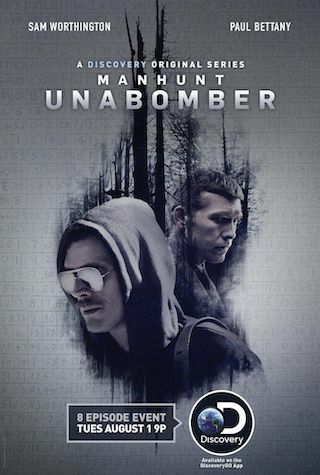 Manhunt: Unabomber (formerly known as "Manifesto") will explore how the FBI caught infamous criminal masterminds, with each closed-ended season following a different case. The first season will focus on the FBI agent, a highly specialized linguist, who using unconventional means brought Ted Kaczynski, aka the "Unabomber", to justice after nearly a 20-year manhunt. The show, said to be heavily serialized and darkly psychological in the vein of True Detective,would provide insight into the criminal and the case but also the psychological effects the cases have on the FBI agents assigned to hunt down the most dangerous criminals who often delve into a kind of madness of their own, becoming totally absorbed in the crimes and forced to live inside the darkest minds imaginable for years.